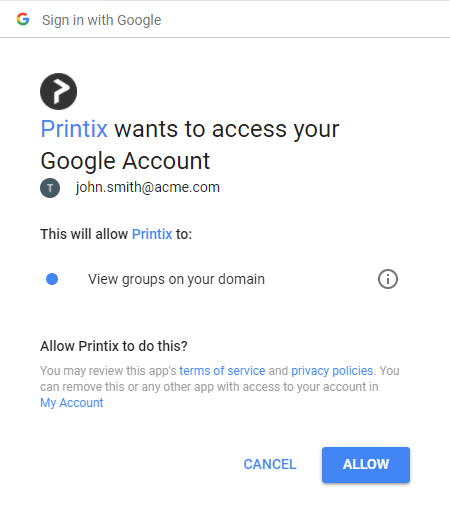 If you have enabled Google authentication you can use Google groups to deploy and control access to printers based on users’ group membership. You must have a G Suite administrator account. On the Authentication page select the Google tab. View groups on your domain. Select Allow, so Printix can synchronize groups. If this is successful you will see: Groups synchronized from Google. The account you used to sign in with was not a G Suite administrator account. RESOLUTION: On the Sign in with Google page sign in using your G Suite administrator account.